Sunderland NZ4117 turned onto final approach to land to the east on the lagoon at Tarawa. The aim was to alight just past the main islet of Betio and parallel to its neighbour Bairiki. The flight from Laucala Bay had been indirect, the aircraft having been tasked to patrol en route. At the time of arrival in the late afternoon of 15 April 1961 fuel was getting low. The aircraft had reserves, but was not going anywhere except the lagoon right there, nor at any time except right now. But there was a problem. The machine had arrived just as a serious tropical line squall hit the atoll. These things can be of great fury but are normally of short duration. But this one had hung around, delaying the landing. Eventually it abated a little and, although the water was still very rough, the captain decided the time had come. The lagoon at Tarawa is large, but is reasonably shallow and sheltered particularly from the east, so open-sea swell was not a problem. Because it is so large and the islet periphery so low-lying, however, there is ample fetch for the wind to whip up a significant short-period steep-sided wave train inside the reef. And so it was on this day. There was no risk of being thrown off the surface by a swell. But, coming the other way at the critical moment, the aircraft met a large, steep-sided wave. Whack – as I've said elsewhere, water is less compressible than dirt. I was one of three pilots aboard that day, and was standing in the lookout position at the astrodome in the roof. There were no such niceties as being strapped in; the lookout just stood there completely unrestrained. When the aircraft struck, it struck hard enough for me to jump down from the two-foot high platform and look for somewhere to go. Slightly forward and to the right, the navigator had been sitting at his station, task done, waiting for touchdown. On impact he, too, decided he wanted to be somewhere else, and stood up. The result was that we both tried to occupy the same space at the same time, which didn't work. 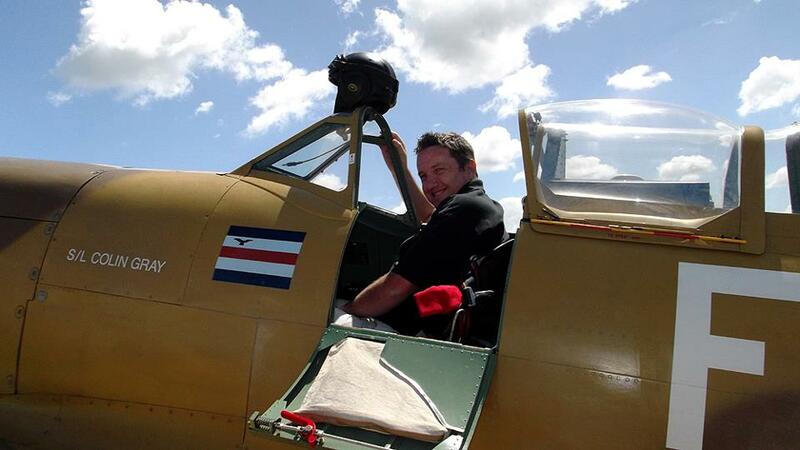 While we sorted that out the aircraft ploughed on, bucking energetically in the chop. Then it began to sink quite quickly. The keelson had broken under the bow compartment. The planing hull was breached. The water remained very rough. The break in the keelson could not be dealt with from the inside, and there was no prospect of inspecting the damage or of doing anything about it from the outside until the aircraft was securely moored. Meantime, water was coming into the bow compartment through the break at a great rate. The APU pump had, as expected, worked briefly and then choked. It was useless. The hand pump could not keep pace with the inflow, though it continued to be used to reduce the effects. This had to be done in relays by crewmembers. The working stroke on the hand pump was the upstroke - its design assumed an upright stance and the use of the major muscle groups in the back. But it was not possible to stand upright in the bow compartment. Cramped and stooped under the low deckhead, the heavy pull stroke fell to the triceps alone, arms akimbo. With the aircraft still not moored and heaving in the sea, in the confined space and in the enervating temperatures to be expected in equatorial conditions, those doing this heavy work soon succumbed to seasickness. They had no choice but to continue knee-deep in sea water in which now floated their own vomit, and which threatened to spill over the isolating bulkheads into the rearward compartments. This was tenacious stuff, some might say heroic, but it was as much expected of crews as it was necessary. And this crew did have a vested interest! But I digress. Why were we at Tarawa anyway, Autolycus the sniffer or no? Physically it is a large, low-lying coral atoll – reputedly the lagoon is among the largest in the world. Formerly a part of the Gilbert Islands as a British dependency, upon independence in 1979 it became a part of the Republic of Kiribati, pronounced “Kiribas”, which is a transliteration into the local language of the English “Gilberts”; the language lacks the letter “s” so it is rendered as “ti”. Far away in the east in the Line Group, the former Christmas Island, transliterated, becomes “Kiritimati”. Kiribati does not include the former Ellice part of the Gilbert and Ellice Islands to the south – they are now Tuvalu. Nor does it include Nauru in the west, one of the “phosphate” islands, which is now an independent State. Controversially, however, it does include the other main phosphate mine, Ocean Island, now Banaba. That island is now largely derelict, most of the Banabans having been relocated to Rabi Island (pronounced “Rambi”) in Fiji after World War II, although phosphate mining did continue on Banaba until 1980. The island groups of Kiribati sprawl over a distance of around 3,000 km east-to-west, and 2,000 km north-to-south. They straddle the Equator and bestride the International Date Line. Tarawa itself is pretty much on a line due north of New Zealand and about 1 degree 25 minutes (85 nautical miles) into the Northern Hemisphere. A common impulse to think of it as of the South Pacific could be challenged, at least technically. 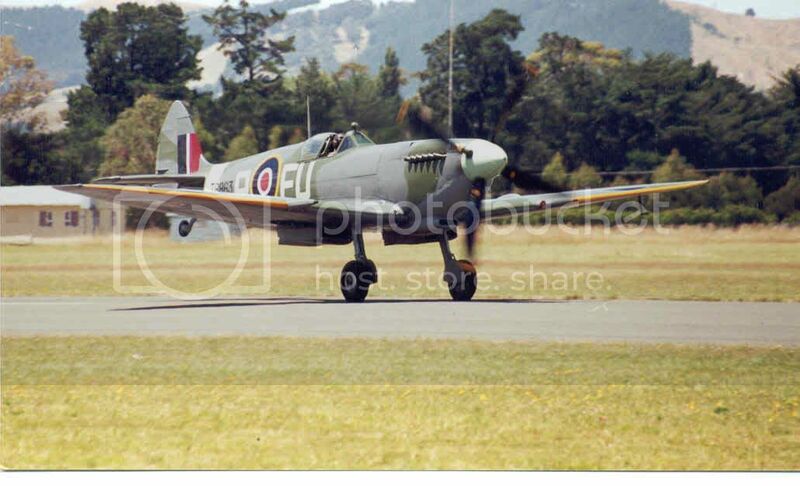 At the time of our incident the RNZAF had a forward base there. Tarawa is a famous name to be sure; but the reason it is familiar to many has little to do with whether or not the RNZAF once had a base there, whether it is situated in the Gilbert Islands or the Republic of Kiribati, whether it is of the South or the North Pacific, or whether the local language spells “s” as “ti”. It was, of course, the scene of a major battle in November 1943 when the Second Marine Division (which had been based at MacKay's Crossing just outside Wellington) landed through the lagoon to wrest it from the Japanese. The tale of valour has been told many times, including the near-disastrous miscalculation of tidal conditions for the Marines' assault landing. We will therefore repeat none of this here, except to remark that the name “Tarawa” has since been borne by two ships of the US Navy, the first an aircraft carrier and the second the class-name parent of a current fleet of five amphibious assault ships. In the 1950s and on, the RNZAF base was "activated" about once every two months or so, for a week or a fortnight, by a one- or two-aircraft detachment from Laucala Bay in Fiji. That is what our particular Sunderland was doing there – activating. In those times the Resident Agent (of the British colonial power) was a fellow whose name looked Mediterranean but who was from an old New Zealand family in Christchurch. In keeping with the times the custom was for the visiting detachment commander to pay a call upon the Resident Agent - with all the formalities of the day including visiting cards. This had to be done. Some Somerset Maugham characters would have felt quite at home. Usually, however, the act itself turned out to be less daunting than the prospect in contemplation beforehand. Hizzonour the Resident Agent, indelibly Kiwi, would like as not wait quietly in the residence, in ambush. When the visiting cards plopped onto the silver salver he would call "Throw yer bloody hat in, 'n' have a beer!" The British influence went back many years. Arthur Grimes' book “A Pattern of Islands” tells it like it was in the early part of the 20th Century. Nor was our resident agent from Christchurch an anomaly. New Zealand's presence in Tarawa was quite strong from time to time. For reasons unknown and unexplainable, in the early 1960s the local ex-pats were fond of highland country dancing. As visitors we had to participate, at the Club. Though I come from Dunedin I had to go to a tiny, isolated part of the Pacific to be introduced to these strange Celtic capers. It is difficult to imagine a more discomposing occasion than an introduction to Scottish country dancing in sweaty heat under ceiling fans 85 miles north of the Equator drinking too much Victoria Bitter from Australia paid for with British pounds. One could almost say eccentric, the only obvious alternative being “troppo”. Tarawa was - and one expects still is - a place of many incongruities besides colonial eccentrics and giddily transplanted rituals from cold Northern climes. On one occasion while at a loose end we explored northern parts of the extensive atoll. Tidal conditions mean that one cannot guarantee to get from islet to islet around the periphery, so the means of travel was a Gilbertese outrigger canoe. Under sail in a straight line those things go like stink, although tacking through the wind can present problems. On a northern islet we came across a substantial building, made of brick. It turned out to be a convent school. Bold as brass, we knocked at the door, and were invited in. Inside, a number of Gilbertese girls were at that very time sitting GCE examinations written in a language not their own, and about subjects not of their society (nor, one supposes, one which they would ever be likely to know well). Curious are the effects of Empire. The Mother Superior was an Australian. She said she had left Sydney in 1936, and had never been back. She had not even been off the atoll, except during the Japanese occupation when she had been interned on Abaiang, just to the north. Before her transshipment she had been made to watch the ritual murder of the "coast watchers" (including 17 New Zealanders) by the Japanese on Tarawa (there is now a memorial to them on the beach). When the Marines re-invaded she had heard the sounds of battle below the horizon, but did not know the result until a USN destroyer anchored off Abaiang and eventually returned her to Tarawa. Sadly this encounter took place before the era of portable recorders, and I had not the sense to write it down immediately, so all I have now to rely upon is memory of a tale told me fifty years ago. On the same day as we were walking through the village, a voice - not one of ours - called out "kamate, kamate". He was an elderly Gilbertese who, rather curiously, could rattle off the names of many of the railway stations on the main trunk line in the North Island. Intrigued, we probed. He said he had spent time in New Zealand between the wars as part of a labour battalion working on the railway. I was slightly sceptical of his story, but concluded I had no real reason to doubt it. He was convincing, and he did know "kamate" and all that as well as the place names on the main trunk. Despite this experience of our ways he had trouble with the idea that I was Captain. Too youthful, he thought. In his terms the flight engineer, who was old enough to be my father, should be in charge because with age comes wisdom (he didn't know the engineer as well as I did!). He offered us toddy, the local and potent fermented coconut brew, prepared right there in the tree. This was illegal. We pointed that out. He said who cares - only those in Betio (it's pronounced “Bay-she-oh”, emphasis on the first syllable) or Bairiki worry about what the Government says. Despite the cultural divide it seems not much was different in Tarawa from other places out of sight of governments. On another occasion we were sent on an errand of gunboat diplomacy to fly around Nauru (or was it Ocean Is, now Banaba? ), with instructions to fire our Browning point-fives into the sea to impress the natives who were restless. We based at Tarawa. We were joined by the RNZN - HMNZS Pukaki I think – which had dashed from Auckland in the middle of post-refit trials. She had made it, though panting somewhat. Wandering the reef in an idle moment I encountered a sailor who had missed the transport back to his ship. I'd been gently observing a crab, backed into a crevice in the coral waving a big fiddler claw. It was a bit pissed off, but about to become more so. He (the sailor) was hungry, he said. He picked up my friend the crab, tore off the claw and ate it right there. No seasoning, either. The heavy coastal guns then rusting on the seaward foreshore were reputed to have been moved from Singapore by the Japanese - who had made the same mistake of having mounted them facing out to sea when the Marine attack came through the lagoon from behind. Whatever, their massive breech castings were stamped with a legend for posterity to see: "W.G. ARMSTRONG-WHITWORTH, LONDON", which isn't in Japan. Speaking of medical matters, on a later occasion I flew the then British High Commissioner for the Western Pacific around his domain - or demesne, as he might have preferred. His home base was in Honiara on Guadalcanal, but Guadalcanal has no seaplane anchorage. We embarked his party early in the morning at Tulaghi on Florida Island, across narrow waters rich in wartime legend. Ironbottom Sound, for example, graveyard of HMAS Canberra and many other ships. Also the infamous "Slot", route of the Tokyo Express. (We'd had adventures of our own during the previous 12 hours when (a) the towed refuelling barge swamped and then overturned, dumping 44-gallon drums of 115/130-octane aviation fuel into the tide, some with their filler caps off, and (b) the aircraft complete with its moorings drifted across the bay in a high wind and heavy chop in the middle of the night; but that is another story). Whilst at Tulaghi I'd contracted a debilitating case of gastro-enteritis which delayed its full impact until after we reached Tarawa. I was like sick, man, and ready to die. Thought I was going to; even hoped I might. The best the resident ex-pat Scottish medico at Tarawa could do was sympathise and offer a jar of vaseline. The things one suffers for Queen and Country! I've steered clear of bearers of vaseline ever since, especially Caledonians. Also baked beans. By the time I recovered a few days later my crew had eaten almost everything there was, except for what seemed to be a whole barge load of Heinz' finest, courtesy of Burns Philp's Betio Branch. They were all that was left. Yuk! Communications were not always easy or reliable in that age, before satellites. The HF radio equipment on a Sunderland was principally CW, by Marconi. One conversed at long range in the staccato yet swinging cadence of Morse dots and dashes by carrier wave snatched out of the air as it bounced between the surface and the sometimes turbulent ionised layers high above. On one occasion, however, the turbulence was man-made. While near Tarawa one night, all communication involving HF radio bounce off the ionosphere was disrupted by a nuclear test experiment set off high above the tropopause. We sensed the flash. The aftermath discommoded the reflecting Heaviside layers for a short time. One of our signallers was a radio ham. Once, defying telecommunication regulations, we set up a small, home-built, low-power W/T transmitter ashore at the barracks, and strung a long antenna between two coconut trees more in hope than in expectation. Dah d'dah dit, dah dah d'dah we whispered on the key, repeating it thrice into the ether. CQ-CQ-CQ, we said to the world in the universal shorthand query. Calling all stations; is anyone there? DE (this is) followed by our callsign. Then QTH (my location is) TARAWA, and a tentative K (over). A pause, listening. Nothing but distant, resonant static. Then the responses crashed in. Suddenly there were incoming calls queued from all over. The United States, Europe, Japan, Okinawa, Australia, New Zealand. And, as news of the contact spread through the amateur bands, more joined the queue in order to log the unusual DX. Having triggered this off at about 8pm, it took until 4am to clear the jam. Obviously, more than 30 years after the battle for the reef, Tarawa continued to weave strange tropical spells! Great stuff Robin! That is history that wouldn't normally be told; at least as far as the Sunderland is concerned. In respect of the guns transported Singapore, however, I've always understood the alleged inability to fire north from the original gun position was a myth. I've always read military stuff since I was at school, and in fact three of my teachers in [ 1954] were ex-military, and one had been a POW in Changi. I spent a year in Singapore, 1966, with 14Sqn, and of course was in heaven as much of the city had not reached the stage of development it is today, and many of the places mentioned in all those books I'd read were still in existence. I also have somewhere a book written by a Singaporean Chinese on the Japanes occupation when they renamed Singapore Shinan-to. There was also a landing strip up at Gong Kedah in Malaya which we , that is the Canberras,used from time to time. It is up near the Thai border, and the east coast beaches on which the Japanese forces first landed. They built the landing strip in fact, although it was sealed when we used it. Back to the guns! Singapore's famous large-calibre guns — which included one battery of three 15-inch guns and one with two 15-inch guns — were supplied with few conventional high-explosive (HE) shells and mostly with armour-piercing (AP) shells. AP shells were designed to penetrate the hulls of warships and were ineffective against infantry. It is a myth that the guns could not fire on the Japanese forces because they faced south. Although placed to defend against enemy ships instead of the straits, most of the guns could turn northwards and they did fire at the invaders. Even if the guns had been well supplied with HE shells, military analysts estimated that while the Japanese invaders would have suffered heavy casualties, they would have succeeded. There were other problems in firing north which were more associated with civilian casualties. If you stand at the top of the hill at Kranji on which now lies the the British War Graves site, you can see a large palace with an even larger minaret which the Japanese were using for spotting, yet the Brits made no attempt to fire on it, and it's just across the strait. In Singapore during 1966, there was a lot of construction starting, and it was not unusual for all work to cease following discovery of unmarked mass graves. These were mainly Chinese of course. I don't dispute your comments on the guns - not at all. I think the "myth" might be based in a matter of expectation rather than in a matter of practice. The Brits simply did not expect the Japanese to arrive at Singapore form the north, having concluded that because the jungle was judged impassable to British soldiers it would be equally impassable to the Japanese. And so they made no provision to turn the guns around because they hadn't expected to have to. It was much the same for the Japanese at Tarawa. They knew of the likely tidal problems in the lagoon because they were there and could see them. Accordingly they calculated that the Amercans wouldn't try it on, but would come from the south and the open sea. So that's where they pointed the guns in their substantial permanent positions. I recall being told while there on one occasion that they did manage to turn one of the guns around to fire in the direction of the lagoon, but by that time the Americans were close in and the gun couldn't be depressed far enough to engage. I've no way of verifying that, but it's believable. Whatever, at the time I was visiting there regularly nearly 50 years ago now, the surviving guns (I actually don't remember how many there were, except that there were more gun housings than there were guns) were pointing southward to the sea, except for one which was pointing the other way to the lagoon. The barrel of one of them, I recall, had been split and shattered, presumably by a direct hit. Incidentally, Phil82, if you haven't read "Forgotten Armies" by Christopher Bayly and Tim Harper, I suggest you should! The subtitle is "Britain's Asian Empire and the War with Japan." Singapore, Malaya, Burma and, to a degree, India. First published Allen Lane 2004, Penguin paperback 2005, the latter ISBN 0-140-29331-0. Well-written, detailed and fascinating - with stuff I've certainly not seen anywhere else. A great story well told, thanks. When I was in Singapore a couple of years ago, I went on a tour of the forts and gun sites. The guide, who did seem to be quite knowledgable, also debunked the myth of the guns facing the wrong way. They could - and were - turned around, but (among other problems) the armour piercing shells were pretty useless against advancing ground troops. There are apparently a lot of British-made coastal guns installed in occupied Pacific Islands by the Japanese. When (in the late 1800s) the Japanese were building up their navy, most of their larger ships were ordered from and built by British shipyards. Naturally, these were equipped with British armament. By the 1920s and 1930s, these vessels were obsolete and were scrapped. However, their heavy guns were removed and placed in storage in Japan. They were therefore available to be shipped to the newly occupied Islands to carry out a 'second life' as coastal defence weapons. Absolutely fascinating stuff Robin, thanks so much for that. As Colin says, it's real history not recorded elsewhere. That's the great think about this forum, we learn so much, especially from you two chaps. The info about the guns is very interesting, but I also love the social history and humour. The drunken doctor with his stehascope on a bleeding toe - priceless. And the story of that nun who was so dedicated to stay there all those years. Amazing. It's great to hear of New Zealand's postwar Sunderlands operating from Florida Island too, where No. 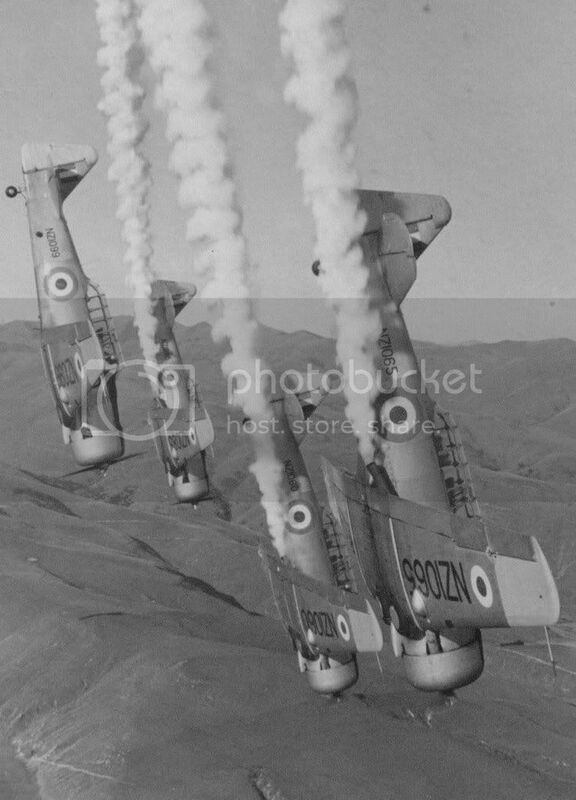 6 (FB) Squadron had an RNZAF Station during the war. I heard a really, really strange story about that place from a chap who was based there with the squadron. Robin, there are a number of books I have my eye on, but as you've kindly provided the ISBN, I might try the library for that one! As it is, Bennetts and Capital Books will miss me when I pop my clogs! The reason those big naval guns were re- used after being taken off scrapped ships was that they were a fine art to manufacture, and not many people made them.They were also very expensive for the day. I hadn't realised until I bought a book by Dr Robert Ballard of "Titanic' fame, on the sinking of the Bismarck, that those huge battleship turrets weren't secured to the ship in any way, they sat in there under there own weight. When Bismarck sank, it initially rolled inverted, and the turrets simply fell off! The ship then righted istself and landed right way up, minus the turrets. Sorry, not aviation related. ! For the record, a couple of weeks later the recovery crew had shored up the weakened area with timber from the inside, and NZ4117 made it back to Laucala Bay under its own steam for permanent repair. Just checked up on my Sunderland file, it would seem that no repair was actually carried out on NZ4117 - "Damaged at Tarawa, Gilbert & Ellice Island, 15Apr61. W/off & scrapped at Lauthala Bay, Fiji 18Aug61"
When Bismarck sank, it initially rolled inverted, and the turrets simply fell off! The ship then righted istself and landed right way up, minus the turrets. Must have been a really wild ride for the guys inside those turrents! Thank you. All these years I'd been under the impression that 4117 was repaired. She was certainly shored up with wooden stiffeners for her return flight to Fiji, and I thought the repair had then been completed there. Oh, well; at least I got the date right! If a large aircraft like that were written off and broken up at Laucala Bay, what happened to it? Did Fiji have a smelter and recycle the metal? Was it dismantled ans shipped home to NZ by a scrap dealer? Or would it simply have been dumped or scuttled? I know the 5GR Singapores were scuttled there in the bay. If only it was fresh water we could pull them up. Before her transshipment she had been made to watch the ritual murder of the "coast watchers" (including 17 New Zealanders) by the Japanese on Tarawa (there is now a memorial to them on the beach). 1941 July 19 Twenty-two soldiers selected from the 8th Brigade Group and fifteen Wireless Operators selected by the New Zealand Post and Telegraph Department embarked on the vessel at Suva for coast-watching duties in the Gilbert and Ellice Islands. They were equipped with low power battery-operated transmitting and receiving sets, accumulators, battery chargers, aerials, Morse keys and headphones. Also provided were twin 230-volt motor-generator sets, extra receivers and banks of batteries plus 13 metre aerial poles. Their standard 3-B-2 teleradio weighed around 135 kilograms, batteries not included, and could transmit up to a 1000 kilometres. 1941 August 18 Radio Operator Arthur C. Heenan, of Hastings with soldiers Charlie Owen and Les Speedy were landed on Maiana island. Heenan wrote that the locals were friendly and he had a lazy time eating and sleeping. None of the coast-watchers ever saw a German, but about 4 months after Japan's attack on Pearl Harbour in December 1941 they were prisoners of the Japanese. All three were among the seventeen coast-watchers and five civilians executed on Tarawa on the 15th of October 1942. 1941 September 1 Viti sent ashore her last coast-watcher party when Max McQuinn supported by soldiers Basil Were and Lewis (Jim) Muller stepped onto tiny Makin Meang island in the Gilbert and Ellice group. 1941 October 11 Viti made it back to Suva after a voyage of 103 days, having erected and tested 15 coast-watching stations. A new memorial will be dedicated at Tarawa, Kiribati, (north east of the Solomon Islands) on Remembrance Day, to mark the 60th anniversary of a World War Il massacre. The Minister for Veterans Affairs, Danna Vale, said the Betio Islet Memorial commemorated the massacre of 22 British subjects, including two Australians and 17 New Zealanders, by Japanese forces on Betio on 15 October 1942. “The majority of those killed were coast watchers who had been held captive by Japanese forces when they occupied the Gilbert and Ellice Islands colony earlier that year,” she said. “Australians Isaac R Handley, a retired Master Mariner and Captain of the MB Mauno of Tarawa, and Reginald G Morgan, a Chief Wireless Operator who was commissioned into the Fiji military forces of the day, were among those killed by the Japanese following an American air raid on Betio. The United States military forces erected the first Betio memorial in late 1943, a large wooden cross with an accompanying wooden scroll listing the names of the dead. Several changes were made to the memorial over time and the British later rebuilt it as a concrete cross with a stone commemorative plaque. This has since deteriorated. “The Federal Government, through the Office of Australian War Graves, has constructed the new memorial from stainless-steel sheeting, to enable it to withstand environmental pressures and provide an enduring monument to this tragedy,” Minister Vale said. Minister Vale said the new memorial would feature the same wording inscribed on the previous memorial, as well as an additional inscription which acknowledged the local people who died during the Japanese occupation. “The memorial will ensure that those so tragically killed at Betio will remain in the hearts and minds of Australians for generations to come,” Minister Vale said. Editors/Chiefs of Staff note: The original inscription on the memorial, and an historical perspective of the Betio Memorial are attached. In memory of twenty two British subjects murdered by the Japanese at Betio on the 15th of October 1942. Standing unarmed at their posts, they matched brutality with gallantry and met death with fortitude. The victims were New Zealand coastwatchers, Australians and British. The Memorial also commemorates the people of the former Gilbert and Ellice Islands Colony who died through the actions of Japanese occupying forces during the years 1942-1945. Let us remember their bravery always. The 22 British subjects executed at Betio on or about 15 October 1942 comprised 17 New Zealanders, two Australians, and three British nationals. Each had been held captive on Tarawa Atoll during the preceding two months as Japanese forces moved to occupy the central and southern Gilbert Islands. The names of the New Zealanders – 10 army personnel and seven radio operators who were posthumously accorded military status – are recorded on the Memorial to the Missing at the Bourail New Zealand War cemetery on the island of New Caladonia. The names of the five civilians can be viewed on page 2717 in the register of Civilian War Dead in Westminster Abbey, London. Contemporary eyewitness accounts recorded that the prisoners were executed following an American air raid on Betio, and that a Japanese overseer in charge of Korean labourers was directly responsible for the beheadings. Although the bodies of the murdered men were then buried in pits, it was reported subsequently that a large calibra shell struck the supposed burial site during the Battle of Tarawa in November 1943. Later searches concluded that there was no chance of locating and identifying specific remains amidst the wartime devastation on Betio. All the New Zealanders killed had been stationed in the then Gilbert and Ellice Islands Colony as official coast-watchers. Seven of their New Zealand coast-watching colleagues, who were captured in the northern Gilberts during December 1941, had been taken to Japan at that time as prisoners of war. They survived to return to New Zealand after the war. An Australian radio operator from Tarawa, who was commissioned into the Fiji Military Forces, a London Missionary Society Pastor from Beru, the Government Dispenser, and two locally resident civilians were the other five men killed. The first memorial commemorating the deaths of the 22 men was a large wooden cross, with an accompanying wooden scroll listing their names, erected by the United States Military Forces after the Battle of Tarawa in late 1943. Over the years, several changes were made to the memorial, culminating in the placement of a concrete cross with a stone commemorative plaque. This memorial became the focal point of Anzac Day observances in Tarawa following the establishment of the resident Australian and New Zealand High Commissions after Kiribati became an independent nation. This new memorial preserves the wording of the previous memorial. A new commemorative statement has been added in remembrance of the people of the Gilbert and Ellice Islands Colony who also suffered and died during the Japanese occupation in this area. There's a report and photos on the memorial deication here. Just browsing, I've re-read this 2007 post from Dave Homewood. And I've something to add, triggered by the mention of Arthur Heenan as one of the murdered coastwatchers. A couple of years ago we were driving through Central Otago and, on a fine day, stopped to take a picnic lunch in the cemetery at Middlemarch. There we found a slightly weatherbeaten headstone that pointed to a story much larger than the words chiselled into the marble. A story which, I'd guess, most New Zealanders would not have picked up from what was written there with such stark brevity. 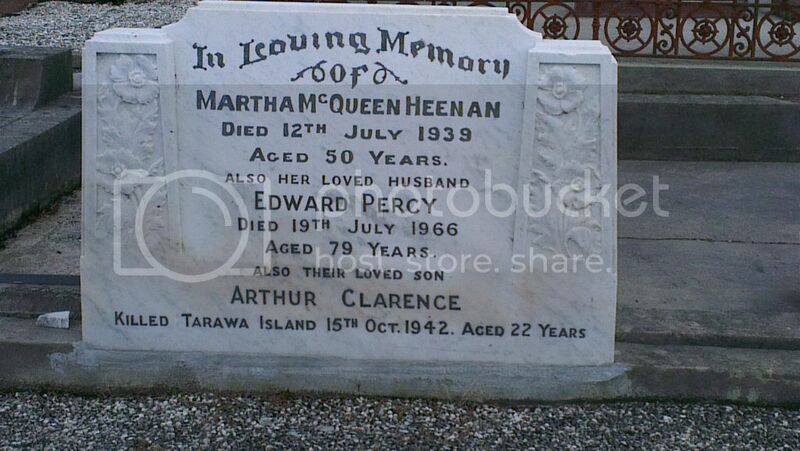 Immediately beneath the legend “In Loving Memory” was named Martha McQueen Heenan, died 1939 aged 50. Next below was Edward Percy, her husband, who'd survived her by another 27 years. But it was a third entry that held my attention. It read simply “Also their loved son Arthur Clarence, killed Tarawa Island 15th October 1942, aged 22 years”. Corporal Arthur Clarence Heenan was indeed one of the 22 beheaded by the Japanese at Tarawa on that day. Seventeen of them were New Zealanders; and seven of those including Arthur were civilian Post and Telegraph radio operators, retrospectively given military rank so their families might qualify for pension support. Each is also memorialised on Panel 1 of the Bourail Memorial in the New Zealand War Cemetery in New Caledonia. Pondering the dates on the gravestone, one could but pray it was a blessing that Martha was spared grieving for her son, since she could never have known what had befallen him. Not so her husband. He carried that burden, alone, for another quarter-century. I mentioned all this at the ceremonial marking the 70th Anniversary of the massacre held at the National War Memorial in 2012. Arthur's brother and sister were both present. Thanks Robin. Welcome back to the forum. It was great to see you at the No. 5 Squadron reunion on the weekend.